It's cold - really, really cold - today. And my garage is not heated. I've been thinking for a while that it's time the upright got cleaned again. Going down the rabbit hole - I discovered the reason it needs a clean is that the last time it was done was 2010 - report here. 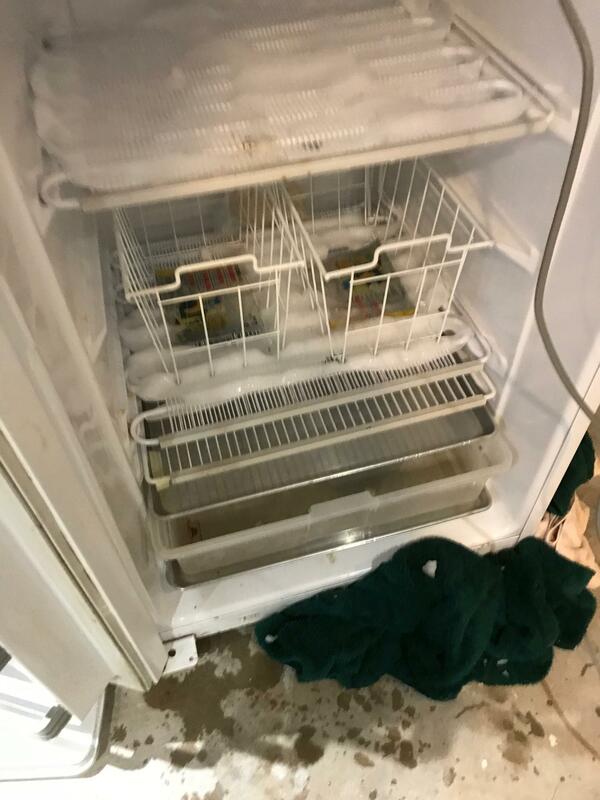 Hubby looked at all the ice buildup in there and suggested perhaps we needed a new freezer but when I explained that 2010 was the last time it was defrosted he decided we could keep it! In 2010 I did it a shelf at a time and tried to make use of what I found - this time I decided it was all or nothing - and in about 4 hours I had it all clean. 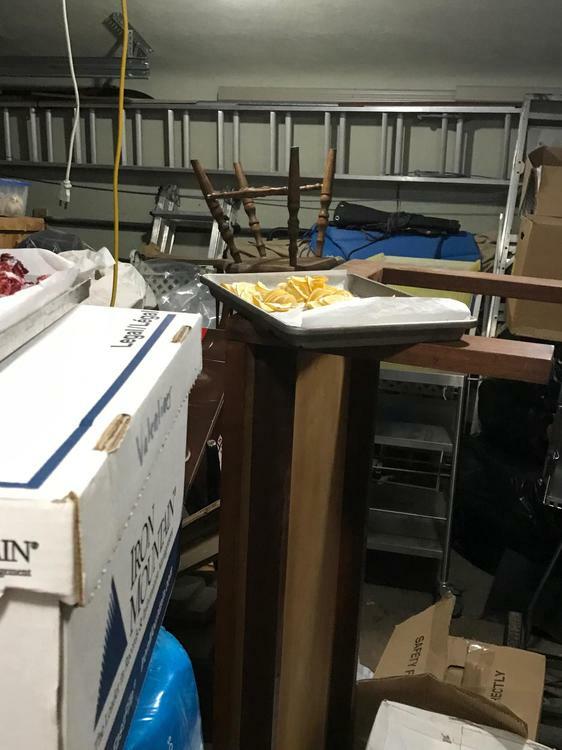 And I had a sink full of chunks of ice, one hair dryer that had taken a bath in the melt and 6 towels in need of a good wash.
Part of my motivation for the freezer needing a clean - I have 4 trays of fruit waiting to freeze dry and the freeze dryer is out of commission for the moment. 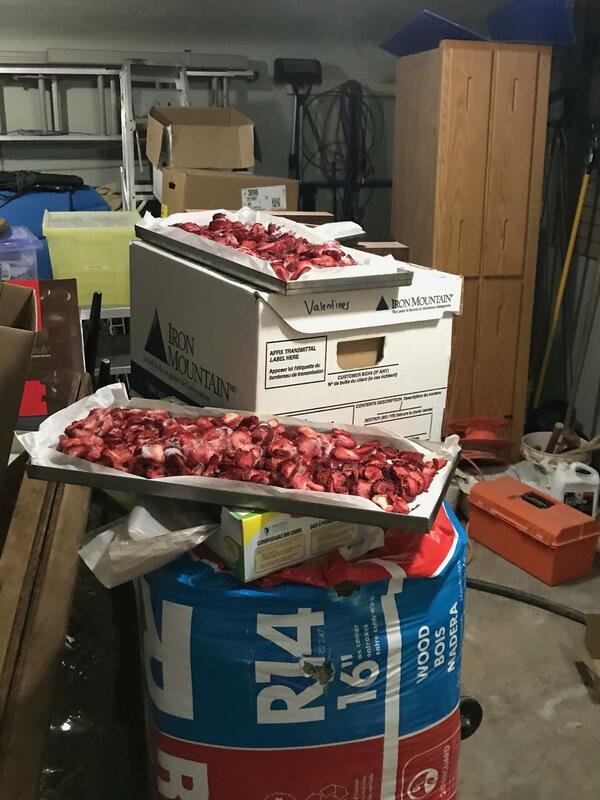 I was having trouble perching the trays in spots on the ice in the freezer! The freezer contents in the really, really cold garage. A very stubborn box of Boiron Apricot puree and a liter of whipping cream refused to come out without much coaxing. Couple of 3/4 sheet pans inside with a plastic container, a full sheet pan under the door and 3 of the towels on the floor. As soon as the towels got soaked - they went into the washer spin cycle and dryer ones replaced them. A heat gun got involved too. 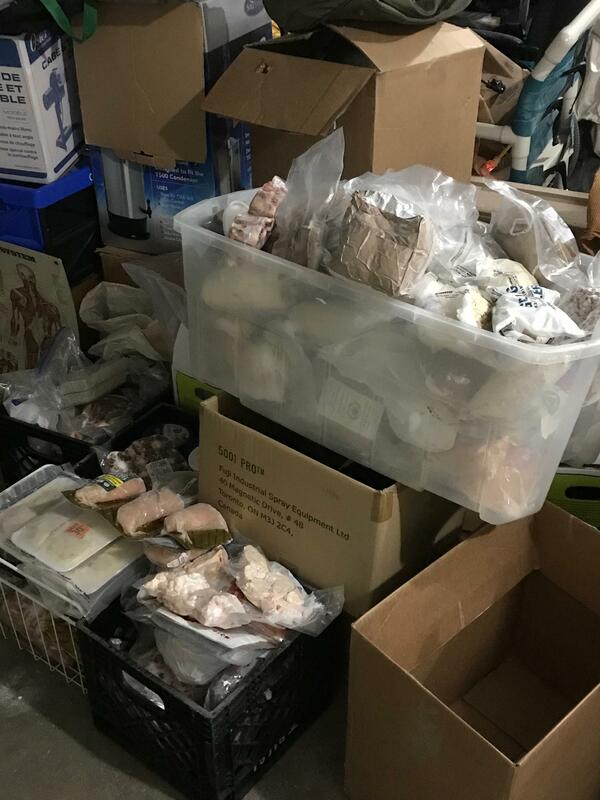 The freezer is now cooling - and later this evening I'm going to go through everything and bin what needs binning and return what needs returning. 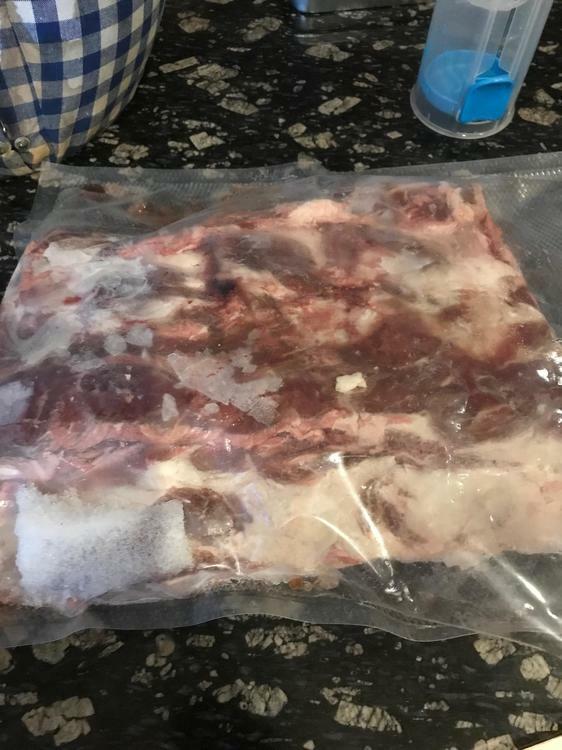 I had one package containing a half rack of beef ribs that ripped open when I was extricating it from the ice - so it was re vac packed and is in the sous vide now for a couple of days. Oh yeah - and two boneless, skinless chicken breasts bathed with it for a couple of hours. Should be a nice accompaniment to the caesar salad I hope to make shortly. 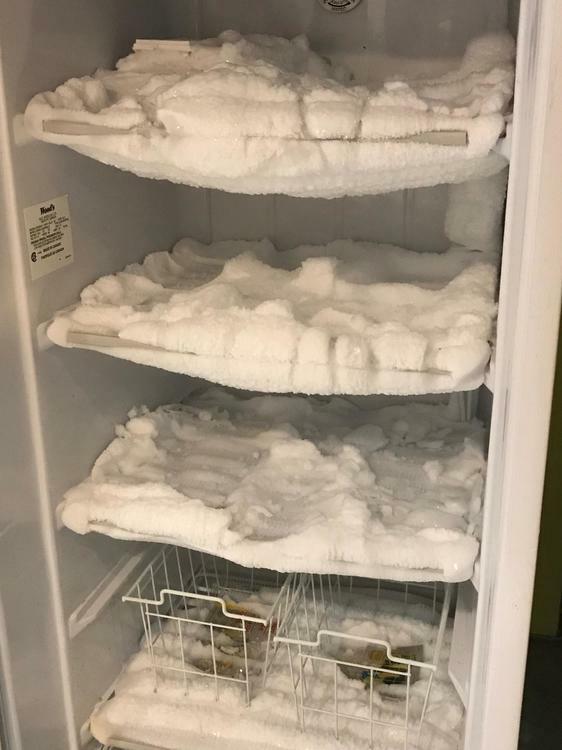 Quite the freezer, @Kerry Beal. Maybe it's time to trade it in for a frost free? 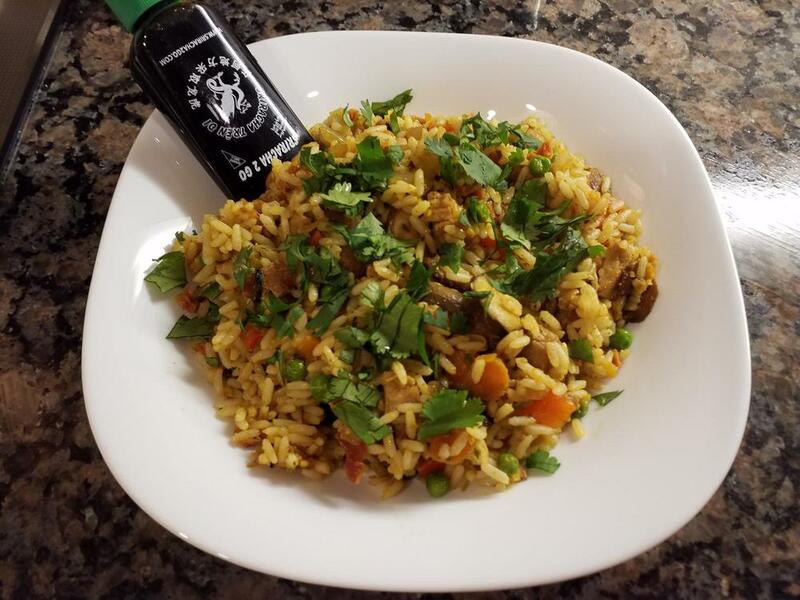 I pulled out some pork tenderloin (Nov. 9, 2017😳) and made nasi goring. The little bottles contain ketjup manis. I wish my freezer were frost free. I do like taking advantage of very, very cold weather to store frozen foods while a freezer cleanout is under way. For some reason I'm under the impression that frost free is not a good choice for a chest freezer. Not sure where I got that idea though. 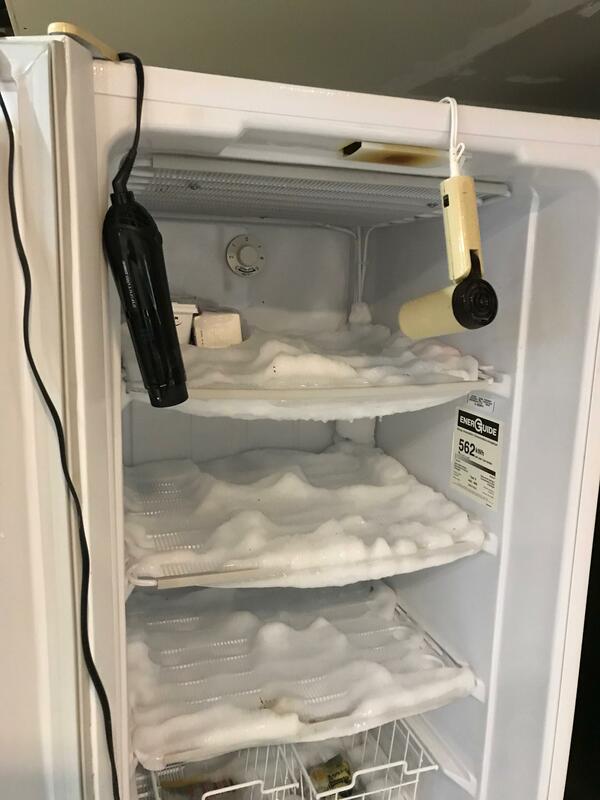 I've read that the frost free freezers work by heating enough to thaw frost and eliminate it, then getting colder again. The result is that the mild freeze/thaw cycles contribute more to freezer burn than a constantly deep freezing temperature. If that's an urban myth, someboday please correct me. Back in the door we have stocks (ham, chicken, duck, turkey, lamb) some puff pastry, pineapple juice, blueberries, andouille sausage, Italian sausage, lard, bacon fat, gravy, coffee and yeast - still a bit of room left. Nuts - almonds of various sorts including bitter almonds and almond flour, pistachio, pecans, pine nuts, sunflower seeds, hazelnuts - also some red fife flour. Can't face any more of it tonight. Need to figure out some sort of containment bins for the rest of the stuff that has to go back. 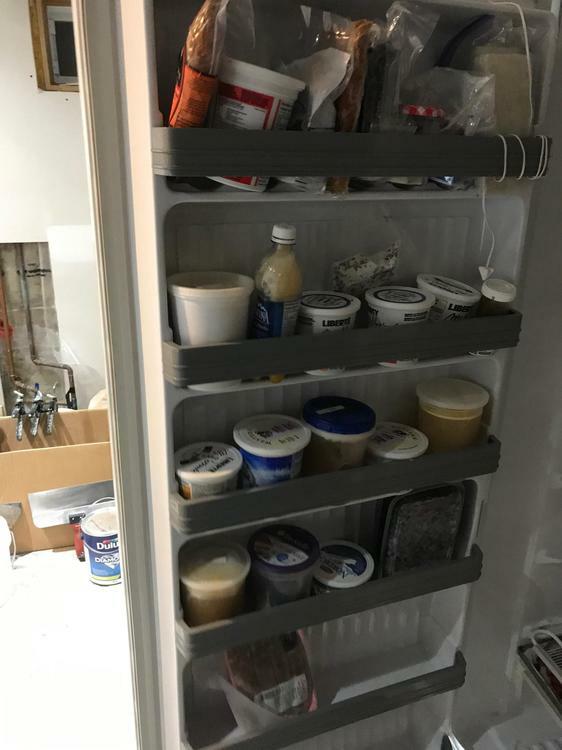 Check out the ones no longer in use in my upright freezer before you do anything else! Good plan - will do. Only freezer I have is the little one that sits on top of my refrigerator. I've got two of those - one day I'll clean those too. Are yours also not frost-free? ...in the summertime at least I mean. I was hoping to see Captain America. 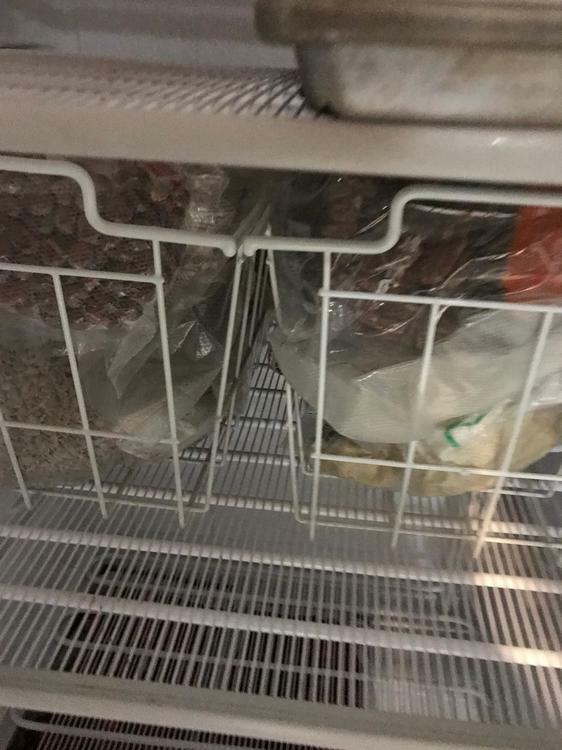 For some reason, cleaning a freezer is so much more rewarding and cathartic than cleaning a fridge. Must be something to do with calving off sheets of ice. And possibly the absence of any smell or mouldy unknowns lurking in the back. 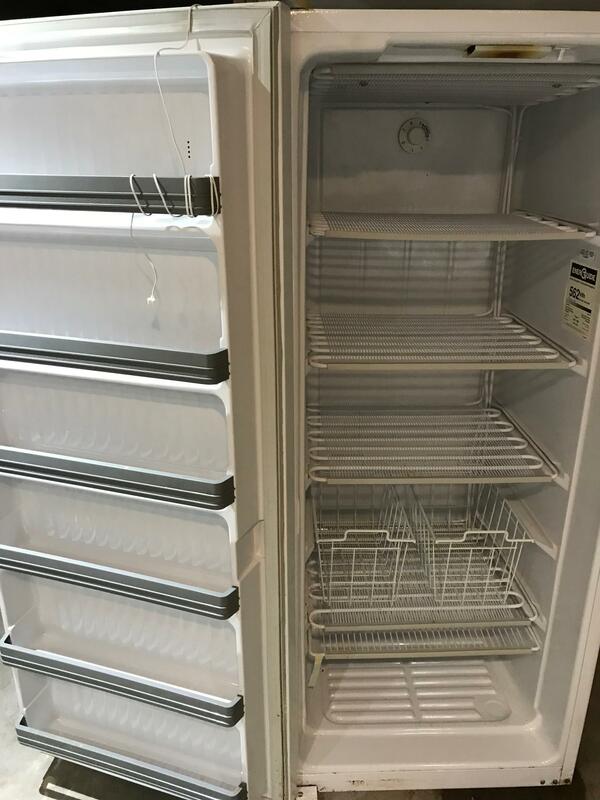 My fridge freezers are frost free. I suspect my little upright in the chocolate room might be frost free as well - thought I don't open it as often so maybe it just doesn't get as frosty. Exactly - I love the calving process! It was aided by some water resistant rubberized on one side gloves that hubby had brought home recently. I find that mine frosts the *most* in summertime, because that's when the air is at its most humid. Kerrie's 8-year accumulation of ice roughly equals mine after 6 months. then I wore some gloves. I decided Never Again ! and use that rather than depends on the weather to keep the stuff Fz. basically , Emptyness is always filled. FB is now pretty much filled. Unless you're in and out of your freezer a dozen times a day, I'd say you're in the market for a new gasket. 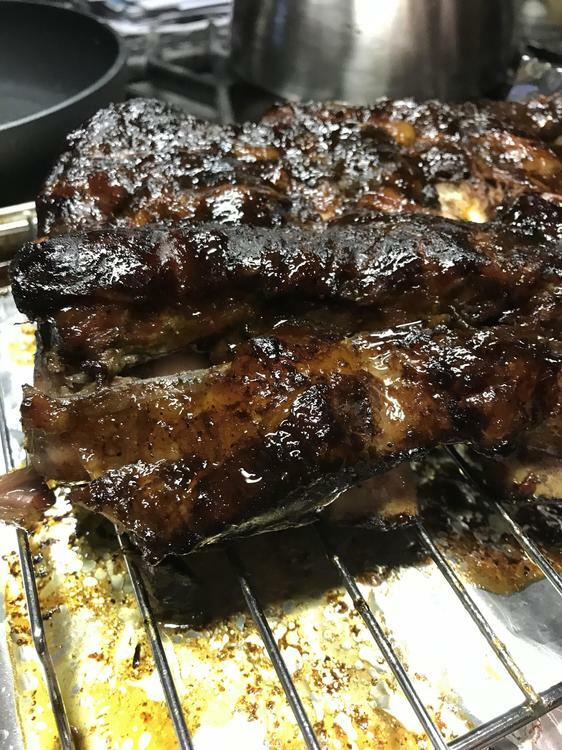 The ribs that’s package tore as I was extricating them from the ice - sous vide 48 hours at 63 C - then CSO Steam broil for about 20 minutes with some Blues Hog BBQ sauce.